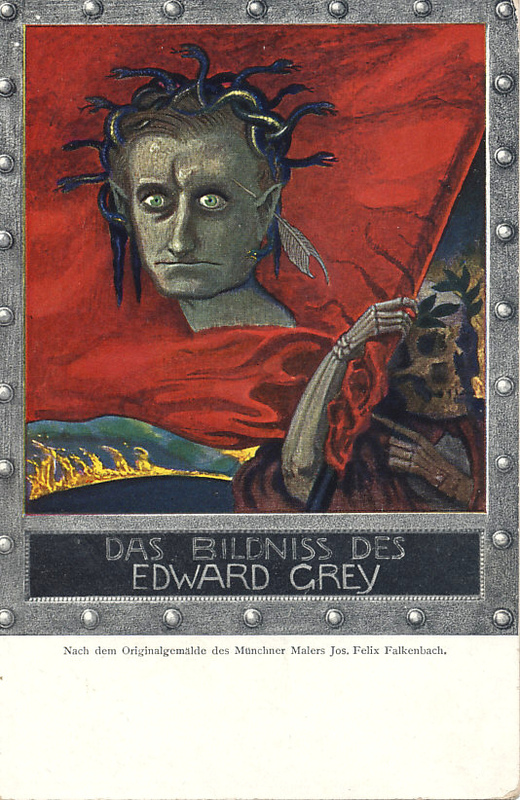 British Foreign Secretary Edward Grey as both Medusa and Dorian Gray. Pointed ears and a quill pen behind his left. Nach dem Originalgemälde des Münchner Malers Jos. Felix Falkenbach. After the original painting by the Munich painter Jos. Felix Falkenbach. 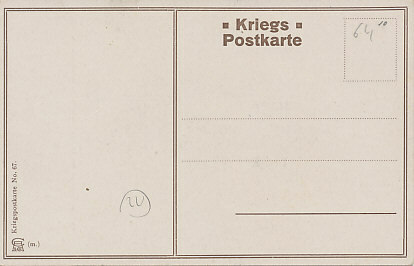 Kriegs Postkarte; Kriegspostkarte Nr. 67. British Foreign Secretary from 1905 to 1916, Sir Edward Grey held the position in the Asquith cabinet in July 1914 as it debated Great Britain's stance should a European war break out. Grey's attempts to hold a European conference to resolve the crisis failed. With many opposed to British involvement in a land war, and arguing the unlikeness of each step in a series of events that would lead to war, Grey laid out what he saw as tending to bring Britain into war. He was committed to defending Belgium's neutrality. The cabinet was in general agreement with him, and Parliament and the country would prove to be. 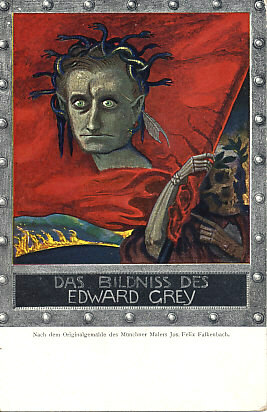 Grey also believed Britain had an obligation to France, a stance with which many in the cabinet disagreed. Grey cited the joint pre-war military planning which called for Britain to defend France's Atlantic coast as the French Fleet deployed to the Mediterranean. Grey held that Britain could neither allow German ships to pass through the English Channel to attack France, nor sit idle should German ships shell the French coast. There was general agreement in the cabinet on the first point, but not the second. Grey worked with First Lord of the Admiralty Winston Churchill to assure that the Fleet would be ready should war come. On August 1, with the news that Germany had declared war on Russia, Grey told the French Ambassador he would not allow the German Fleet in the Channel. The next day, he formally notified the German ambassador. When the Cabinet met on August 2, Germany had invaded Luxemburg, violating its neutrality. The same day, Germany delivered its ultimatum to Belgium. On August 3, King Albert of Belgium requested that Britain defend Belgian neutrality. With the majority in the cabinet agreeing to the King's request, Grey addressed Parliament, then delivered an ultimatum that German forces leave Belgium. The ultimatum expired at 11:00 PM London time on August 4.